There are some days that just defy all good sense, some days that go awry, and some days are like creepy crawly bugs - unpredictable and wiggly and a little funny looking. Missing part word problems are kinda hard. We really have to think hard to figure those things out. When we get it right and understand that math, our teacher gets pretty excited and sometimes she scoots around in that old, wooden rocking chair. Sometimes a rung falls out of the bottom and she fixes it. A lot. 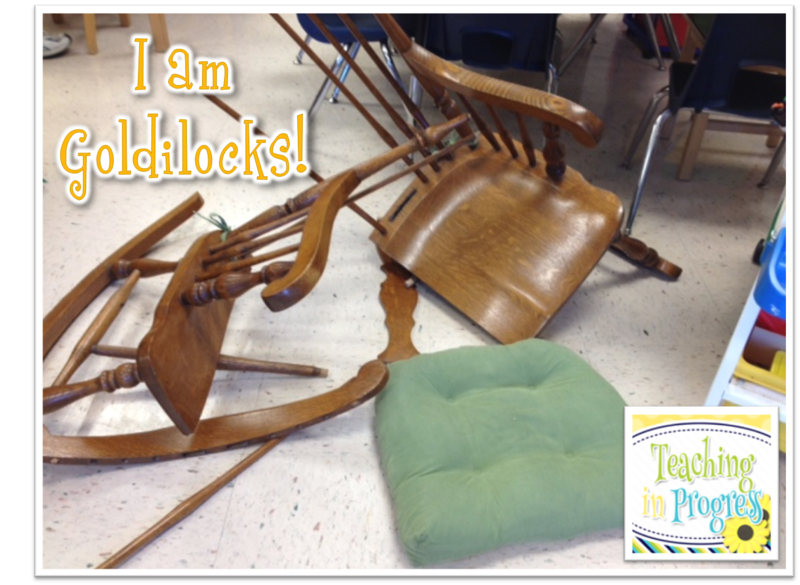 And sometimes, (okay not sometimes - really just this once), the whole chair splits in half, collapses to the floor, and there is the teacher sitting in a pile of chair parts. Some days you really discover where your brain is. In a split second, when the adrenaline flows and your heart races and you discover that you are sprawled out in the floor in a pile of spindles and splintered wood, the first thing that comes to mind and flies out of your mouth is incredibly revealing. "I have a connection!! I feel like Goldilocks!" No - the first place my teacher brain went was making a connection. Those comprehension skills are so deeply embedded in my brain that they superceded naughty words! And they got it. And we laughed. And we didn't take our math test. Of course, after a wiggly, funny looking bug day happens, you can't just up and take a math test. We'll save that for a plain ol' nobody laughs hysterically at the teacher for 20 minutes day. Sorry for your loss! ;) Great job finding the silver lining! Thanks! I asked my carpenter husband if he could fix it. He said, "It's firewood." Guess that answers that question! Now THIS is taking a teaching opportunity to a new level! Can't stop giggling. Love, love, LOVE this post! I have that exact same chair and the bar across the middle comes out all the time! I'm going to be more careful. ....thanks for the uplifting post!